Craft Arena: 100+ and still going strong! 100+ and still going strong! Those of you who have been in the studio recently may well have been waylaid by Ray showing off the Singer sewing machines that have been donated to Craft Arena! 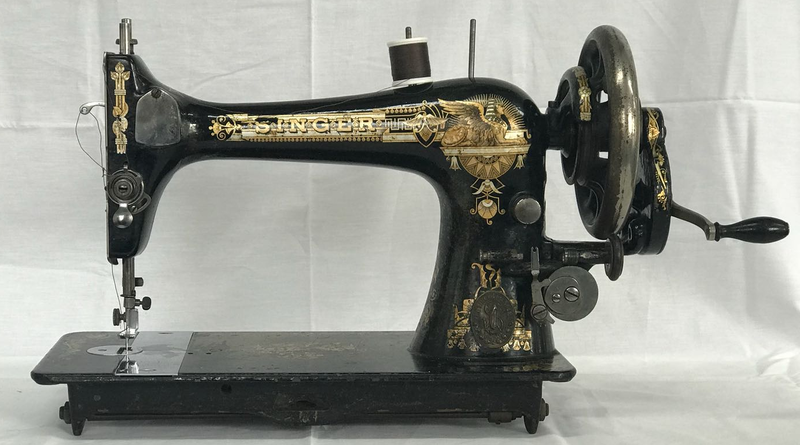 The machines are both made by the Singer Sewing Machine Company. Singer has been around since 1851, originally an American Company, in 1867 the Singer Company opened a factory in John Street, Glasgow. The company diversified into a number of areas in the 20th Century, and its Electronic Systems Division was purchased by GEC-Marconi in 1990, renamed GEC-Marconi Electronic Systems, and was later incorporated into BAE Systems - a little known fact that may interest readers in Chelmsford and Basildon! Close to home as Ray used to work there! The Sewing Machine Division was sold in 1989 to Semi-Tech Microelectronics, a Canadian company and the Singer Corporation is now part of SVP Worldwide, which also owns the Pfaff and Husqvarna Viking brands. This company is in turn owned by Kohlberg & Company, which bought Singer in 2004. The Glasgow factory closed in 1980. Judging by the number of comments we’ve heard in the Studio, many of you will remember Mothers and Grandmothers having one of these little beauties! The first one given to us is a 1901 Type 27 machine with the famous Sphinx transfer. Every machine has a unique serial number stamped on the baseplate, and there are a number of websites where you can track down the year of manufacture. It had been stored in a shed for a number of years and so needed a little tender loving care, a little oil and some “percussive maintenance” - Ray hit it with a hammer. The second one is a slightly older VS2, dating from 1895. This type was manufactured until 1940. Both of these machines are now stitching perfectly after 117 and 123 years respectively, a testament to Victorian engineering. The sad thing is that they are practically worthless, a quick ebay hunt will find similar models for under £25 – if you go and collect them that is! The treadles are more expensive as the tables can be repurposed into coffee tables. The value of the sewing machines is low mainly due to the fact that between 1884 and 1943 the Glasgow factory produced approximately 36,000,000 sewing machines! 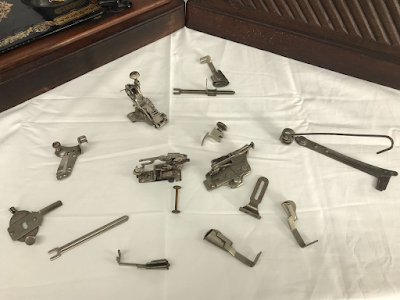 If you’re interested in seeing the machines in real life – or possibly even trying them out after more than 100 years – drop into the studio and we’ll be more than happy to show them off!